Murad Environmental Shield Essential-C Night Moisture's rich Shea Butter delivers instant hydration that lasts throughout the night. Our patented Skin Repair System restores a youthful look to environmentally stressed skin. Essential-C Night Moisture also delivers increased elasticity and firmness by encouraging collagen synthesis while Vitamin C neutralizes damaging free radicals and brightens skin. Delivers increased elasticity and firmness. 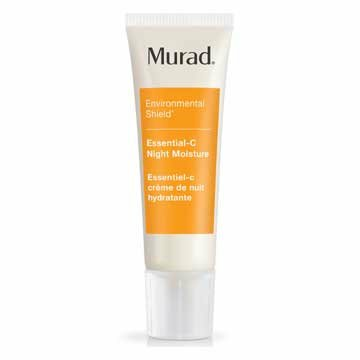 Murad Environmental Shield Essential-C Night Moisture is a rich, antioxidant-enriched moisturizer formulated with a method meant to boost firmness during the night time. Shea butter delivers immediate moisture to maintain silky and velvety skin. Vitamins A, C and E promote cell renewal to enhance skin tone and appearance. Algae and grape seed extracts help increase collagen and restore the appearance of skin that has been damaged by external factors.